No wonder the left hates Walmart. The company feeds more people more for less than any socialist system you can imagine today. You could do better by getting the free turkey my ShopRite gives if you spend 200 in the previous six weeks, and by buying only fresh cranberries and vegetables plus frozen stuff on loss leader. Canned and processed are less nutrititious andess tasty. We have our own potatoes, sweet potatoes, Brussels sprouts, broccoli, pumpkin for the pie, apples from corners of a small garden, and are only buying cranberries, sausage,flour, butter, spices plus that free turkey. Stuffing from leftover homemade bread. We will feed 8 for $10 with leftovers for several more meals. 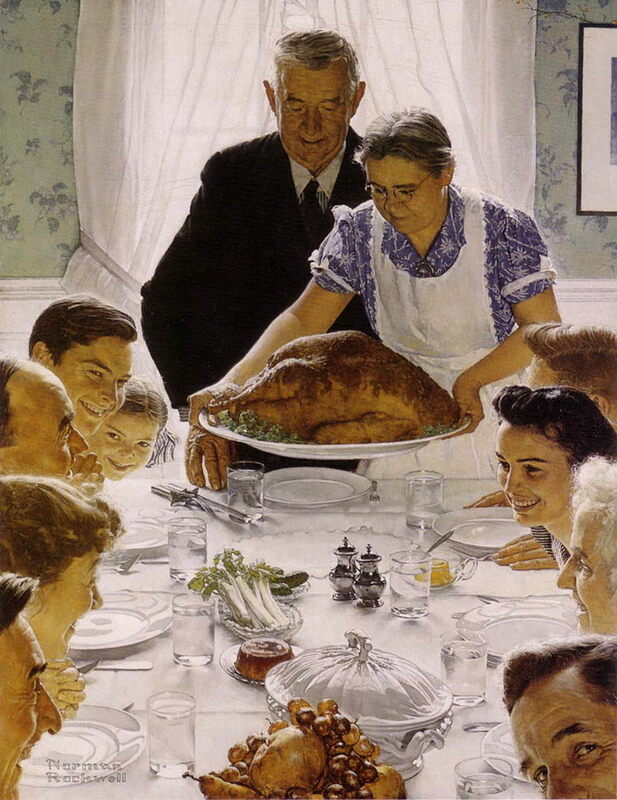 What would Thanksgiving look like if Rockwell had not captured it in that painting. Two great ideas at the bargain end of the scale! Here's one at the other end: if your employer gives you the opportunity to make double pay working on Thanksgiving, you can use a fraction of it to buy fabulous food ready to go from a multitude of places that cater to the busy and better-funded. You're adding to your value as an employee, making good money and having a wonderful meal along with a few precious evening family hours. Choice. That's what America is all about ... or used to be. If we can't stop the ObamaTrain, soon there will be only two choices: the self-annointed immoral elite with plush lifestyles galore, and us rubes who get standard issue everything insulting thrown our way by those who plundered our money and our lives. As Patrick Henry said: Forbid it, Almighty God! Wow! Way to go Wal-Mart. The Wal-Mart post highlights a broader point, and that is the affordability of food in this country. Cheap food is the foundation of a strong economy. It means more disposable income for other things. Being fat and full enables people to worry about imaginary fears. Fears that would readily dissipate if they knew real hunger. Cheap is not worth any price, and not all the grousing about Walmart is unfounded. They collude with town officials to get sweet deals at taxpayer expense to set up new stores and their pay scale and weighting for part time (no benefits) are emblematic of a growing part of the job sector. Some of that is fine but a country cannot live by the lowest common denominator and Chinese goods alone. Does quality of life have meaning any more? It does to me. At the same time I am probably in the Walmart demographic. We should not celebrate the fact that millions in the lowest economic class can get cheap food so much as decry the fact that those same people are paid crap wages in the first place. It is a vicious cycle. Walmar is do excellent job, and we need to learn from it, if u have low barget, then we ask you to spend this barget. No matter how, Walmar will earn at last. Hannon, you want high wages for unskilled workers AND cheap prices. I want an island in the Caribbean and a houseboy that looks like Johnny Depp. Retriever: that's all well and good if you live near a ShopRite (I've never heard of it), and if you have space to grow your own vegetables. A lot of people who live in cities don't even have balconies to grow things in pots. That being said, I'd substitute frozen or fresh vegetables for the canned, the price difference isn't that great. I didn't say I worship low prices or cheap goods. Nor did I say that unskilled labor should get high wages. Neither of these has been an American standard to the degree they are today and the unthinking acceptance and proliferation of both has been destructive. Walmart has got a bad rap for good reasons while Target and K-Mart have not come under the same fire. All mega-corporations are not alike. One of these day's I'll join a Wal-Mart protest. I'll carry a sign reading "Down With Low Prices!!! Down with Wide Selections!!!" "A loss leader?" Really? Who knew? Whatever could that be? But then again I just might be eating this Thanksgiving. It depends on where I am (Seattle just can't stand having a Walmart inside its borders) and how many show up. If I'm in Chico I have no doubt that Walmart will get a visit. Unlike many residents of Seattle, my mom is not crazy. You find a good progressive talking point, and some incidental gloom and doom, in everything, don't you?